Life with Aspergers: Book Review and Giveaway: "How do I teach this kid to Read?" by Kimberly A. Henry, M.S. 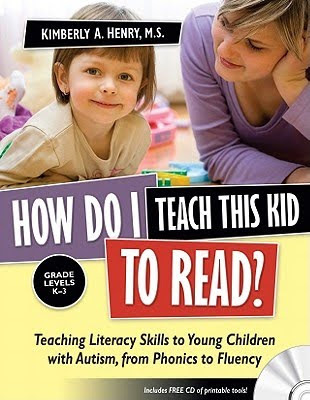 Book Review and Giveaway: "How do I teach this kid to Read?" by Kimberly A. Henry, M.S. This is a "Best of the Best" post - Giveaway details are at the end of the post. by Kimberly A. Henry, M.S. How do I teach this kid to read is a great text book aimed at very young readers on the spectrum. Unlike most books of its kind, this book comes with a companion CD. As well as parents, this book is also a great resource for teachers and would-be teachers in special needs as it explains a lot of great techniques and most of the ideas in this book could be stretched beyond reading and into other areas of a child's education or social life. Most of the materials needed sections refer to resources which are already on the supplied CD (which contains 48 files, mostly in PDF format) but the book also contains redirects to other suppliers, web sites and references. The book covers word walls, flipbooks, pictographs, thinking in pictures and more. Along the way, the "why it works" section for each activity frequently explains autistic traits and how the world appears to people on the spectrum. "Because some children with ASD have difficulty processing questions, Question Sticks put the question in a visual format - a format the child may better understand." This very practical book is a necessary resource for parents and teachers who deal with difficult readers from about Kindergarten to Year 3. I have no hesitation in recommending it. How do I Teach this Kid to Read? can be purchased online from Future Horizons or from Amazon. Honesty clause: I was provided with a copy of this book for review at no charge. All you have to do to enter this giveaway is leave a comment on this post saying why you think the book will be particularly suitable for you. If you can't think of anything, just leave a comment anyway - I'll be drawing the winners randomly. PLEASE leave me a way to contact you via email or facebook if you win - If I can't make contact within 48 hours, I'll need to do a redraw. Please enter me in the contest. I have two little ones and we're constantly working on their literacy skills. This book looks like it'd be a great fit for us. Thanks! Reading is a main area of concern for my son. He should be reading at 40 words per minute but is only reading at 14 w.p.m. Sounds like this book could really help me to help him! Reading is a main area of concern for my son. He should be reading at 40 words per minute, but is only reading at 14 w.p.m. It sounds like this book could really help me to help my son! I was diagnosed with Asperger's about 3 years ago aftermy song was diagnosed. While learning about it, I began to suspect that I was an aspie too. Finding that out has really helped me relate to my son and how he learns differently. Recently, I started volunteering to teach music at our local church. In addition to helping teachers and parents of Asperger's kids, I think this book would also be beneficial to me, as a teacher, to better understand how to relay the information I have, as well as being able to allow me to help my son, who has also recently started studying music. My email address is anthony.rockstar@gmail.com. Also, I have a music blog at http://www.soundwavesamurai.blogspot.com that I am just starting up, so please feel free to visit and take a look around. This book is fantastic. I'm not entering (sorry if that confuses things) since I already own this book, but just wanted to say how great it is! I am a teacher for kids with Autism and I have had my eye on this book for a while and would love to win it! I am dedicating my blog all month long to Autism Awareness. I could absolutely love to win this. Please enter me. We homeschool our 4 kids. I have a 6 1/2 year old that has autism, tourettes, sensory processing and integration disorders, low tone, severe visual spatial delays and eye tracking problems. We have tried so many many things with him. Now we are starting to get our 5 year old son tested and believe he is autistic as well. Its hard because as a homeschooling parent the financial is all on you. We are on our 5th phonics program for my son. This would be a huge blessing to our family with all the heartache over phonics and attempting to teach him to read we have been though. He is my 3rd child I have taught (well trying to teach him)to read but my 1st with Autism (plus everything else) Thanks so much. My son has just turned five and was diagnosed with Aspergers about six months ago. He loves books, but no matter what we do, we just can't manage to get letters to stick in his brain. Letter recognition is hard. We've been reading to him for years, and he often walks around the house reciting entire books he's memorized (he listens to audio books a lot). Any help we can get would be great, and this book sounds like a good resource. Please enter me in this contest!! Sounds like a fabulous book! I am presently spending $75/week for reading tutoring for my autistic kid. Would love to win this book. PLEASE sign me up...my son is mostly nonveral, but is interested in words and letters...reading and learning to spell would be a GREAT thing for him, communication-wise! This looks great! My son Norrin loves to read and recognizes many sight words. However, he's not really reading but memorizing everything. I would love the opportunity to really teach him. @Lisa Quinones Fontanez If Norrin can memorize the information he sees, and re-produce it in some form, such as speak or writing, by definition he is reading. He may not be reading following the stereotypical methods, but he _is_ reading. As an autistic myself, I never remember a time when I could not read in some shape or form. Writing and reading come to me much more naturally than speaking or listening ever did. this looks practical and helpful! !